Home > News > Pie, Peas and Presentations! 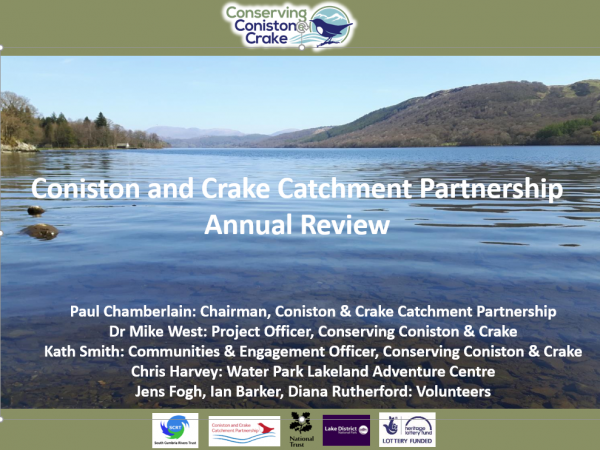 The recent Coniston and Crake Catchment Partnership Review Night was a great success. Supporters and volunteers heard about the work of the Conserving Coniston & Crake project from Mike and Kath, including 8556 metres of fencing already installed/agreed, 480 metres of watercourses de-culverted, tree planting, activities with 200 students and teachers from John Ruskin HS & Penny Bridge Academy, volunteers contributing 180 days of work and of 10 events involving over 320 adults and children. Three volunteers also gave brilliant presentations about the work they are particularly involved – Water Quality monitoring from Ian Barker, Gravel Cleaning from Jens Fogh and Schools & Community events from Diana Rutherford. Chris Harvey from Water Park also gave a presentation on the de-culverting work and the first phase of reedbed restoration. After the delicious pie and peas the evening was rounded off with a summary of work planned for 2019 – it’s going to be very exciting!